After showing a lot of relentlessness in a 4-3 loss against the North Bay Battalion on Wednesday night, the Ottawa 67’s will be playing their first home game in almost two weeks, as they face the Barrie Colts on Saturday at 2 p.m. The Barber Poles will then be hitting the ice once again exactly 24 hours later, as they host the Sault Ste. Marie Greyhounds on Sunday. Ottawa was on the road for their last four games, coming out with two wins and two losses. They were able to win two tight games against Owen Sound and the defending champion Hamilton Bulldogs, before dropping Wednesday’s contest against North Bay. Quinn Yule, Tye Felhaber and Noel Hoefenmayer were the 67’s goalscorers in that one. The Barber Poles will now look to bounce back in front of their home fans, and they will have two occasions to do so over the week end. The Colts are off to a very decent start to this OHL regular season with two wins in four games, but the most impressive thing is the way they have won those two games. They were victorious in their opening game of the season, which they won by a whopping 9-2 score over the Owen Sound Attack. Their other win was another high score of 10-3 against the Sudbury Wolves. The Colts are counting on a dynamic offense that counts on 2017 OHL first overall pick Ryan Suzuki, who has already put up 11 points in 4 games this year. Forwards Lucas Chiodo as well as Matej Pekar have also stood out, both players amassing 8 points in the first four meetings of the season for Barrie. The Hounds are a hungry bunch this season. The Soo was defeated in 6 games by the Hamilton Bulldogs in last years’ Rogers OHL Championship Series, and with a fair portion of their core-group coming back, they will indeed be a team to watch this season in the OHL. Impact forwards Boris Katchouk and Taylor Raddysh won’t be back with the club, but the Hounds can still count on the services of Philadelphia Flyers 2017 first rounder Morgan Frost, who finished the season with 112 points last year. Sault Ste. 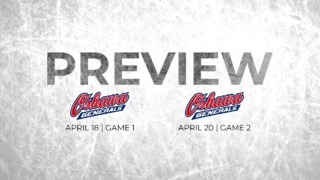 Marie is another team looking to bounce back from a loss, as they were defeated 2-1 by Sarnia in their last contest. Thursday night, they will begin a three-game road trip that will end in Ottawa on Sunday, with stops to Peterborough and Kingston along the way. – Noel Hoefenmayer is now on a 4-game point streak. He has put up 5 points (2 goals, 3 assists) during this streak. – Austen Keating and Sasha Chmelevski have both been lights out in the faceoff dot this year. On 71 attempts, Chmelevski has won 66.2% of them, while Keating has won 62.5% of his 48 attempts.